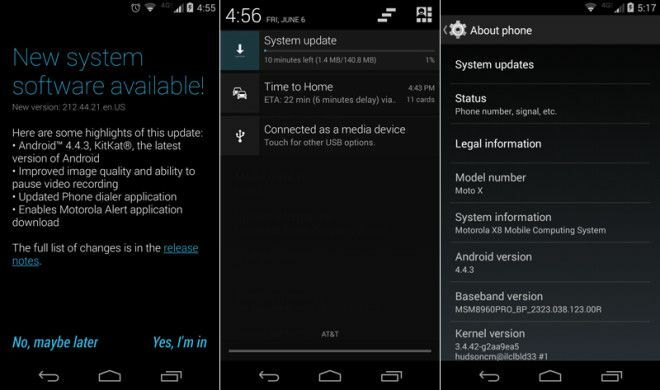 If you’re one of the few T-Mo users rocking a Moto X, you’ll be glad to know the latest version of Android – version 4.4.3 – has landed. If you haven’t received a notification to download in the past 24 hours, you should check your settings for software updates manually, and it’ll more than likely be there. News of the update comes just one week after Motorola announced a ‘soak test’ for pre-release testing. Android™ 4.4.3, KitKat®: Android 4.4.3, KitKat, is the latest release of the Android platform. This release includes several stability, framework and security fixes in addition to accuracy improvements to the power profile. Camera – Improved image quality: Improved camera image quality including better consistency of exposure, more realistic flash coloring, improved photos in low light conditions using front camera. Camera – Pause video recording: Added the ability to pause video recording with a convenient pause/resume button on the viewfinder. Updated Phone dialer: Updated Phone dialer with a new graphical layout and colors to improve consistency and usability. Enables Motorola Alert Application download: New Motorola Alert application sends periodic alerts with your location to your selected contacts. Now available for download from the Google Play Store. Let us know if you download it successfully, and – of course – if you’re enjoying the the update. What about the Moto G? Will that be receiving 4.4.3 in the near future? Yes. My wife already had the update pop up on her Moto G yesterday morning. There seems to he a bug in the update that causes attempts to send an SMS to fail. I’ve confirmed that it’s a system issue, as I’ve tried several different SMS apps and the same exact issue occurs on my phone, my wife’s phone, and our families’ phones after updating. I had the same issue, but unlike an earlier poster I wasn’t able to reenable the stock messaging app. Factory wipe and a fresh install fixed everything. I’m surprised there isn’t VoLTE support added in this update. What gives? T-mobile is only allowing the Note 3, LG Flex and Galaxy Light use it for now, they don’t want the VoLTE network to become flooded. I don’t think the 3 people with the Moto X on T-Mobile would ‘flood’ their VoLTE network. I honestly don’t think that’s the reason for limiting it to those 3 devices. Its more likely because they’ve only done testing on those devices. Hey, I’ve got 2 so that’s at least 5. Maddening that TMO doesn’t sell it directly but even if they did I guess it wouldn’t have been the unlocked and customizable one anyway, which is half the attraction. It is a great phone, especially for the money. I own one and think its a potty T-Mobile doesn’t market it. You failed to include the Moto G, it also has the update. Moto E as well. It seems to work so far, though it did not fix my issues with the mail client. Hate the new dialer otherwise no issues. That new dialer looks like it was stolen from Windows Phone. Ugh. Anyone having autorotate issues on the xperia z 4.3 c6606? ?